The practice of pharmacy is evolving to meet the present needs of customers. Pharmacy services have evolved from the traditional model of business where dispensing, counselling and collection of medications have all been carried out within the licensed pharmacy premises. The current way for supply of dispensed medications is through direct supply to the customer following a face to face interaction between a pharmacist/ supervised staff and the customer within the licensed pharmacy premises. This allows the qualified pharmacist to evaluate the overall health and needs of the customer, perform prescription order review if required, as well as to conduct medication counselling. It may not always be practical for customers to visit the pharmacy in person and in some circumstances it may be necessary and appropriate for the dispensed medications to be supplied by means of arranged delivery to the customer. This provides increased access and convenience to customers. Currently, the law in Singapore sets out that Pharmacy-only (P) medications and Prescription Only Medications (POM) can only be sold or supplied, or offered for sale or supply within a licensed pharmacy by or under the supervision of a qualified pharmacist. Exceptions had been made by the Health Sciences Authority (HSA) to allow home delivery of medications but limited to repeat or partial prescriptions. The entire process of supply and delivery of medications shall comply with Good Pharmacy Practice Guide and relevant legislative and professional requirements. 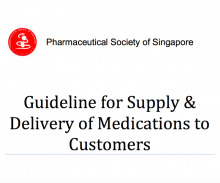 This guidance therefore sets out the basic framework for the implementation of delivery service in pharmacies registered in Singapore to ensure the proper storage, security, traceability and safety of medication delivery and compliance with legal and professional requirements. With the guideline in place, medication supply via delivery shall be extended to new prescriptions, in addition to refill prescriptions. As practice and regulation governing practice is continually changing, the Pharmaceutical Society of Singapore (PSS) acknowledges that any published guideline can neither be exhaustive nor absolutely complete. This guideline will be reviewed periodically as deemed necessary by PSS in consultation with Singapore Pharmacy Council (SPC), Ministry of Health Chief Pharmacist Office (MOH CPO) and Health Sciences Authority (HSA).